The National Fire Protection Association (NFPA) tracks structural fires caused by hot work. A 2016 report revealed that from 2010 to 2014, hot work caused an average of 4,440 structural fires each year. These resulted in property damage of $287 million and approximately 12 fatalities annually. The highest number of gas cylinder incidents come from welding and cutting torches, which account for nearly 60 percent of reported fires. But, fire is not the only gas cylinder safety hazard to be aware of when working with torches that are heavy and awkward to move. Cutting and welding torches use dual gas cylinders – one acetylene and one oxygen. Each cylinder has a pressure regulator connected to a hose. The two hoses join in a mixer or handle where the gases combine before igniting at the tip. Oxygen-acetylene torches are found in homes, manufacturing sites, commercial centers and other environments. 1. Separate the two gas cylinders with a firewall. 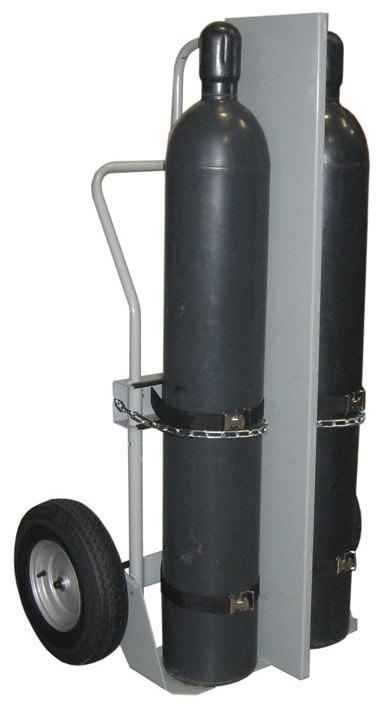 Gas cylinder hand trucks with firewalls use steel encased Marinite® I* to create a one-hour fire barrier between the fuel and the oxidizer cylinders. If the fuel cylinder ignites, a release of oxygen will speed up the fire. Separating the two cylinders with a firewall gives emergency responders time to extinguish the fire before these catastrophic consequences occur. 2. 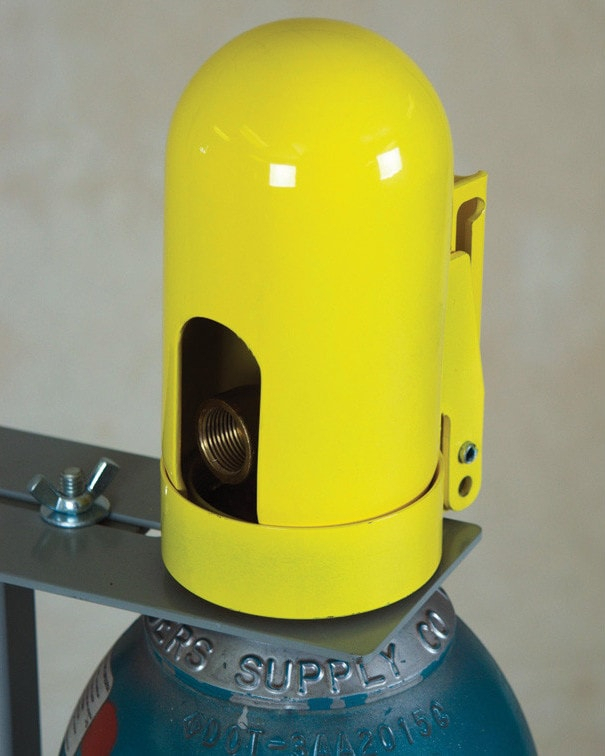 Prevent unauthorized access to gas cylinders while on a jobsite. Only trained and authorized personnel should have access to cutting and welding torches. While they may look simple to operate, there are too many hazards and risks to place them in the hands of the untrained. 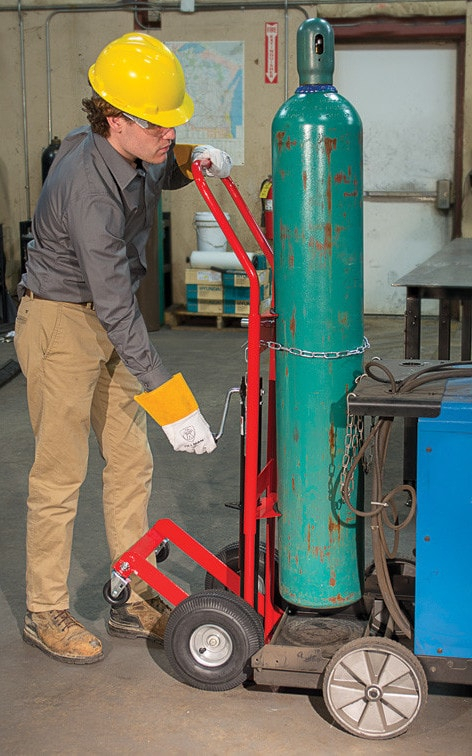 Construction sites often use gas cylinder hand trucks with hoist rings to suspend cutting torches away from harm. These have locking posts and collar plates to ensure complete immobilization of cylinders. The strong structural framing is a gas cylinder safety measure and allows it to suspend from cranes at the end of shift or when not in use. 3. Use safety snap caps for extra security. As mentioned above, cutting and welding torches are dangerous pieces of equipment. Safety snap caps provide a lockout device to limit unauthorized access to the valve control. The caps must be unlocked before performing a welding or cutting task. This small inconvenience prevents untrained personnel from using gas cylinders without supervision. 4. Use double gas cylinder hand trucks with v-shaped cylinder support to keep from rolling. Once a full gas cylinder starts to roll, its momentum makes it almost impossible to stop. Trying to bring a rolling cylinder under control can cause serious injuries. Justrite double gas cylinder hand trucks feature v-shaped cylinder supports. Their loading plate lies completely flat, eliminating the need to lift a cylinder during loading. As an added safety measure, heavy-duty poly straps secure the gas cylinders into a position of safety so they cannot move. 5. 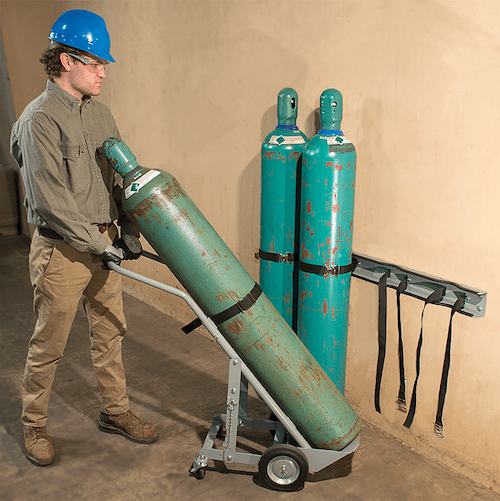 Only lift oxygen-acetylene cylinders with mechanical lift assistance. Due to their heavy weight, falling gas cylinders cause many injuries, including fractures and contusions. Sprains and strains are also common when trying to maneuver heavy cylinders or stop them from falling. 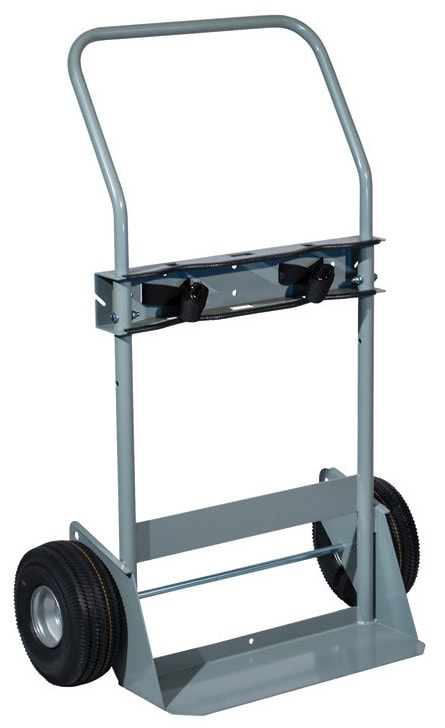 Practice moving gas cylinders safely with lift-and-load cylinder hand trucks. These gas cylinder hand trucks have integrated jacks with hand cranks that allow users to raise and position gas cylinders without over-exertion or injury. *Marinite® I is a registered trademark of BNZ Materials, Inc.
Gas cylinders are heavy and awkward to move. They often contain hazardous gases under pressure. Reduce the potential for injury by practicing safe gas cylinder handling and using products engineered with safety in mind. View our wide range of gas cylinder storage and handling equipment to keep your workplace safe.